Since Maury’s writing nearly 150 years ago, we now know that the Gulf Stream does not originate in the Gulf of Mexico as its name implies. Instead, it is part of a larger ocean-wide system flowing from Africa along the Equator, then up the coast of South America, past the Caribbean islands and into the Gulf of Mexico. As the water is further warmed by the sun in the shallows of the Gulf, it rushes east and north through a deep, narrow strait some 25 miles wide between Florida and the Bahamas. At this point the current typically averages 3 knots, although it can reach speeds up to 8 knots at times. This Gulf Stream is the fastest and largest current in the Atlantic; over a billion cubic feet of water rushes past Miami every second. The current continues up the eastern seaboard to the Arctic, over to England, and finally back down to Africa like a giant wheel turned clockwise by the pull of the moon and rotation of the earth. 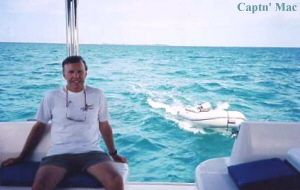 Boaters traveling between Florida and the Bahamas pass through the Gulf Stream. In local boating circles, this passage is known as “the crossing.” Much is written about crossing the Gulf Stream in a cruising boat, and many sailors make the trip daily without incident. But careful planning and proper safety precautions are essential. The foremost consideration is wind direction and velocity: any wind from the south under 15 knots is ideal; any wind from the north over 15 knots is dangerous, creating short, steep waves that can be treacherous for smaller recreational boats. Another consideration is time. The prudent boater must allow enough time to obtain a proper weather window and then enough time to make the crossing to arrive at a landfall during daylight hours. The distance is not that great, from 43 to 85 miles depending on departure and destination points, but wind direction and current will dictate Speed Made Good. 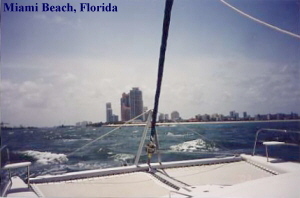 A sailboat departing Florida into an easterly wind and southerly cross current may have to leave at night in order to arrive during daylight hours. Tacking into wind and current at 6 knots of boat speed can result in SMG of only 2 or 3 knots. At that rate, even the shortest distance of 43 miles will take anywhere from 14 to 20 hours of hard slogging. Sailing west to Florida in the same conditions would take as little as 6 or 7 hours. Final considerations are your vessel, equipment, and crew. Make sure you have a seaworthy craft (not a runabout) with proper Coast Guard approved equipment (VHF, flares, life jackets, etc.) and adequate fuel. Travel with another boat if possible and, as with any offshore passage, never go single-handed. A competent crew should be able to take over should the skipper become incapacitated. Finally, let someone, a friend or relative, know your departure and arrival times and call them when you’re safely in harbour. If you’re headed from the States to the Bahamas a reasonable level of navigational skills is required to ensure you reach your intended landfall of Bimini Island or West End of Grand Bahama Island. You need to pay attention to magnetic variation (seven degrees west), current, and wind effects or you could end up in Portugal. Heading from the Bahamas to the States is less problematic; it’s hard to miss land! Just recently I was given the opportunity to make a crossing of the Gulf Stream – from the Bahamas to Florida – in a 45-foot catamaran. Florida Yacht Charters has bases at Marsh Harbour in the Bahamas and Miami Beach and Key West in Florida. They asked if I would relocate one of their charter yachts from the Bahamas to Miami Beach. I readily accepted, as one of my goals in life was to cross the Gulf Stream in a sailboat! Sandy, my first mate, and I flew from Edmonton, Alberta to Miami where we met our friends Barry and Joan from Vernon, British Columbia. The next morning we flew to Marsh Harbour and boarded “Wind Chaser” to begin our six-day return trip to Miami Beach. Our afternoon was spent shopping for food and receiving a thorough boat and chart orientation from “Uncle Bob,” manager of Florida Yacht Charter’s Bahamas base. That evening we visited the nearby Jib Room restaurant, sampling their specialty ribs and participating in a limbo contest to the calypso sounds of Brown Tip and the Rake and Scrape band. We were definitely a long way from Canada! Marsh Harbour is located in the heart of Abaco, a Mecca for cruising boaters. A chain of islands 130 miles long block the Atlantic swells, providing tranquil waters the colour of turquoise. Gentle easterly trade winds during summer months offer comfortable beam-reach sailing in the predominately north-south sailing area. Quaint little settlements are sprinkled within easy sailing distances and their harbours all have balls (buoys) for tying off overnight. The friendly and helpful Bahamians are as welcoming as their sun-drenched shores, inviting boaters into their shops, bakeries, and restaurants. Snorkeling, scuba diving, fishing, beach combing, and frolicking in the surf are just a few of the reasons sailors return to Abaco. 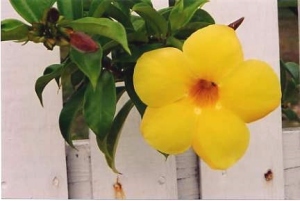 Sandy and I had sailed Abaco on two previous occasions; we rate it as one of our favourites. Our plan was to visit a couple of the popular islands, Great Guana Cay and Green Turtle Cay, before venturing west out of the primary chartering area. At Great Guana we anchored in beautiful Bakers Bay, snorkeling and lazing on one of the prettiest beaches to be found anywhere. 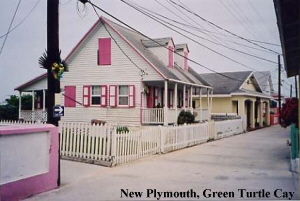 At Green Turtle we browsed the shops of charming New Plymouth, stocking up on a coconut pie, conch salad and locally-crafted gifts for the folks back home. Although we wanted to linger in this pristine paradise, we had just four days to cover nearly 200 miles. Our route took us next along the northern edge of Little Abaco and Grand Bahama Islands to an anchorage at Great Sale Cay. We then sailed to West End of Grand Bahama Island, tying off in Old Bahama Bay Marina. Many boaters use West End as their jumping off point to return to Florida, but because our stateside destination was southwesterly, we decided to sail south, outside of the Gulf Stream, to Bimini Island which would put us just 43 miles directly east of Miami Beach. We docked at Alice Town on our fifth day and enjoyed a superb dinner of conch fritters and blackened grouper on the veranda of the famed Big Game Club overlooking the marina. This club was one of Ernest Hemingway’s hangouts during his many deep-sea fishing expeditions. The nearby Compleat Angler Hotel, where Hemingway lived and which influenced The Old Man and the Sea, displays pictures and memorabilia of his exploits in the Islands. The next morning dawned bright and sunny with southeast winds of 10 to15 knots – ideal conditions for a crossing. We were unable to obtain a weather forecast on our VHF but noted that research vessel “Coral Reef” was nearby. Sandy contacted them and they confirmed that the present conditions would hold for our crossing. “Go with blessings,” said the helpful Bahamian lad as he untied our remaining dock line and tossed it aboard. Our estimated speed of seven knots would have us across in six hours. Our course line was drawn at 269 degrees True. We had three options for navigating across the stream. One, enter Miami Beach as a waypoint on our chart plotter and steer whatever heading it took to stay on course. Or two, estimate an average drift of two knots for the entire trip since the 3-knot stream is only a 25-mile portion of the total distance. A slightly more complicated procedure involves steering a predetermined heading during the Gulf Stream portion that would take us first below and then above our course line. Since we were on holidays, we kept it simple by choosing the second option: on our 6-hour trip we would steer 12 miles south of Miami Beach on a heading of 259 degrees True, using our chart plotter to verify position. Having hoisted grog with the ghost of Hemingway, I was half expecting something exciting to happen along the way – an angry sea, breaching whale or demented pirate – anything to embellish the crossing. No such luck. We pretty much drifted according to plan, arriving at the outer marker of Miami Beach channel within 15 minutes of our ETA. Approaching Miami Beach Marina, we took down our Bahamian courtesy flag and raised our yellow quarantine flag. No one is allowed to leave a vessel entering the States until the captain clears Customs, which I was able to do by phone after docking. We then took a taxi to Immigration at Port of Miami to have our passports stamped returned to the USA. A final word on crossing the Gulf Stream: know the weather. Listen to your VHFWx channels; in Abaco tune in to the Cruisers Net on channel 68 at 0815 each day; pick up Nassau radio (1540 kHz) or Freeport radio (810 kHz); ask other cruisers; or stop by a marina for a weather fax. Good weather? Go with blessings.